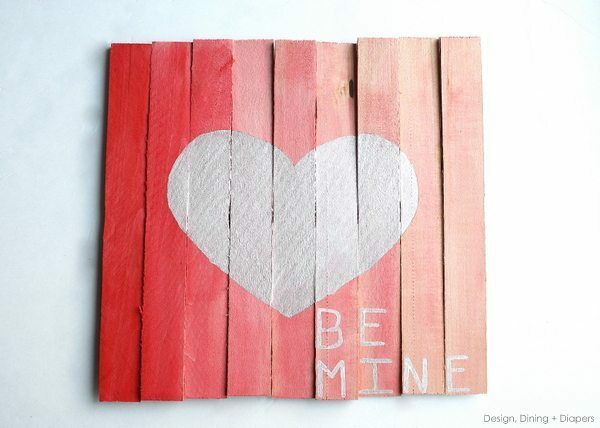 Today, I’m sharing my Mini Pallet Valentine’s Day Art made with wood shims and Dye-Na Flow Paint by Jacquard Products. 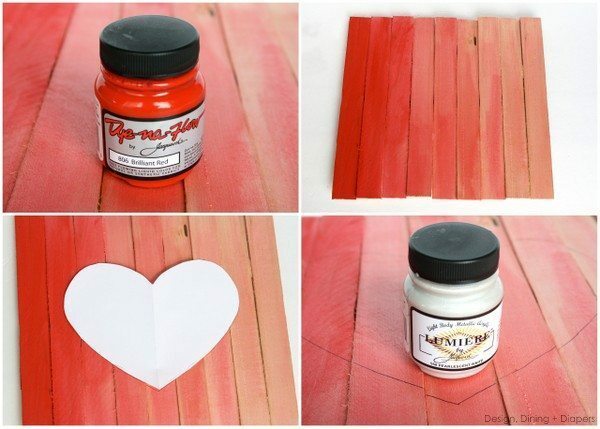 This paint was really fun to work with, and it is perfect to use on wood. It has the consistency of a wood stain but comes in a variety of vibrant colors. This paint is definitely worth checking out if you like to work with different stains and wood treatments. 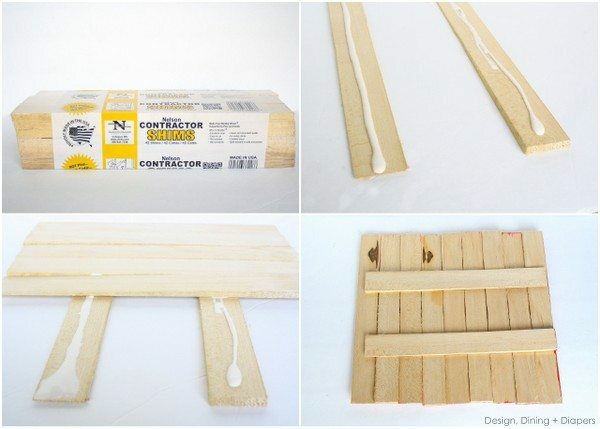 To create the mini pallet, I picked up a box of wood shims from the hardware store. It cost me roughly $5.00 for a pack of 42 and I only used 12 for this project so I have many left over for future projects. I’m still loving the ombré trend happening right now and I want to embrace it before it goes out of style! The look was really easy to achieve using the Dye-Na Flow paint (details below). And I just love how the Lumiere paint adds a little shimmer to the pallet. This is my second time working with the paints (first time on wood) and I really love them. They go on beautifully and the sheen is perfect. Once the mini pallet is dry, it’s time to paint it with the Dye-Na Flow Brilliant Red Paint. It was really easy to achieve this look using the Dye-Na Flow Paint. Like I mentioned earlier, the paint is the same consistency as wood stain, very thin, so to achieve the ombré look I mixed the paint with water and added a little more each time to get it lighter and lighter. The darkest red is the paint color straight from the jar, and then I slowly added a little more water to each remaining stick. The last board was mainly the brush dipped in colored water. 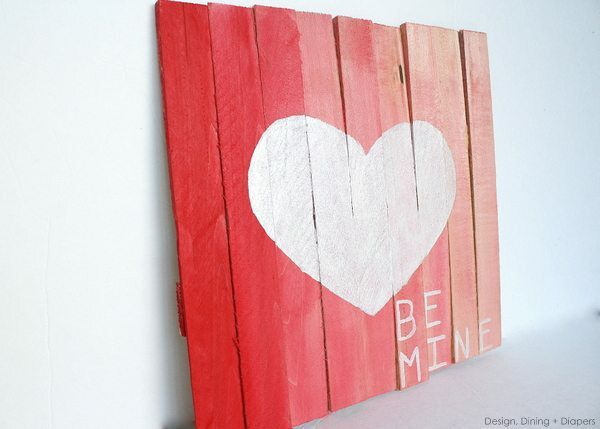 Once the red paint is dry, cut out a heart shape and trace it onto the mini pallet. I chose to free hand the heart instead of using a stencil because of how uneven the edges were. The lumiere paint applied beautifully onto the wood surface. This paint is heaven, I honestly can’t say enough about it. I love the sheen it added to the pallet. So cute! I usually don’t decorate much for Valentine’s Day, but this project fits my style perfectly and has inspired me! :). I’m intrigued by this paint too, where is it available for purchase? This is super cute! 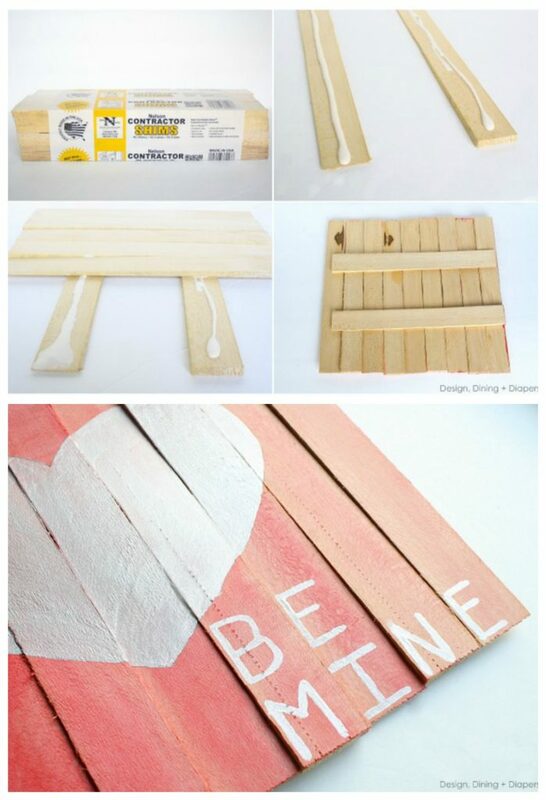 I love the idea of using the wood shims. I have a pallet outside but I haven’t broken it down yet to work with it so the shims sound so much easier! Love this! It turned out really cute. I’ve been wanting to make one of these for awhile but cannot decide what to paint on it. So cute! I love wood projects and have not heard of/used shims before. Now following. This is darling! I love simple art! I’ve been wanting to try something with pallets. I think the mini ones are the way to start. Thanks so much for the great idea! LOVE your site! This is just perfect! I have been wanting to make something with wood shims for a while now. (Seriously, I have them on my project list). Thanks so much for the inspiration! Such a fun idea ~ love the rustic and festive feel! What a great project. I love how you created this with shims. I found your lovely blog from Chase The Star link party. 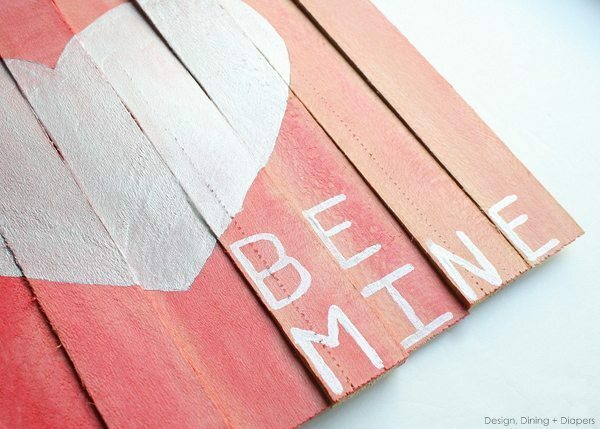 In Feb, I will be hosting a link party using wood. I would love for you to add your DIY project. 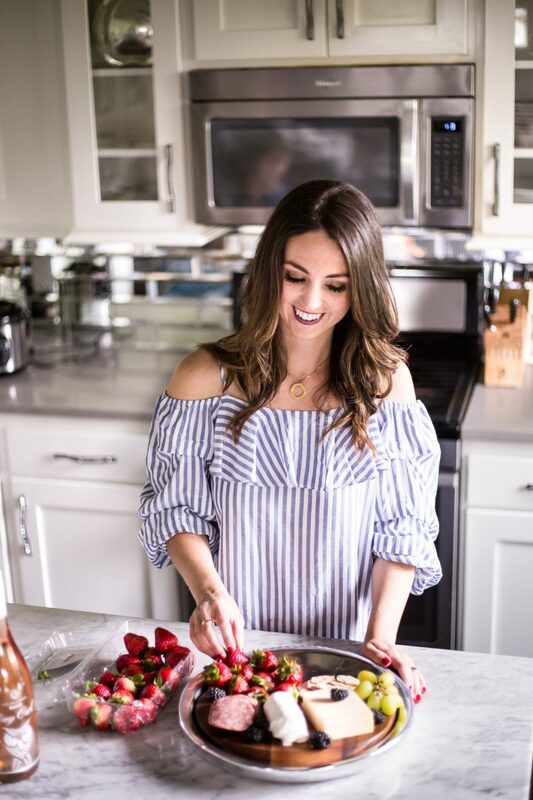 I love looking around your lovely blog and I am a new follower too. I love how this turned out! The ombre effect is great and what a novel use for contractor shims! Really simple, yet totally cute! I need to get my act together on my Valentine’s decorating! Just stopping by from Monday Funday Linky Party! This is adorable, and i have everything but the shims. I think I’ll try it! That is a great idea. I love pallets and reclaimed everything. I’ll do a ginormous one and post a link. Thanks for sharing that idea for making a mini pallet. I haven’t gotten out a big saw in years so doing one of the regular size pallets is too imtimidating for me but like Goldilocks sez…”this looks just right” . Thanks also for sharing about those paints…I have not heard of either one of them before. 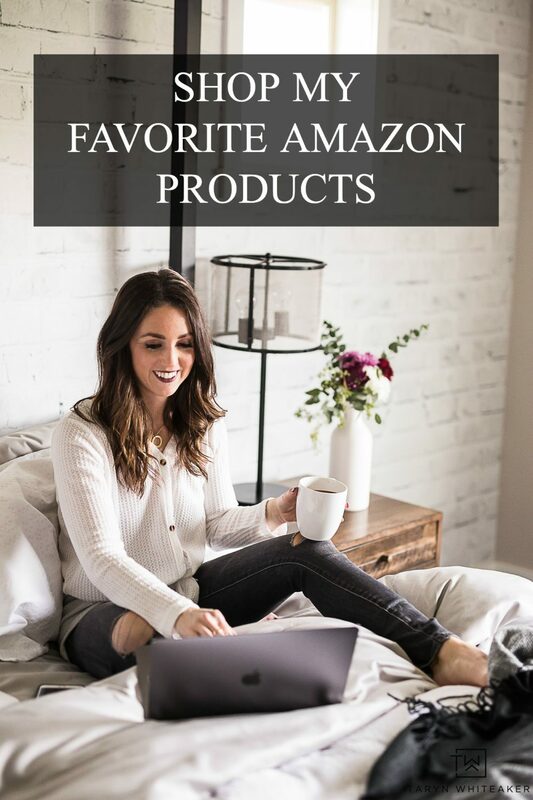 I saw your post over at “Home Stories A to Z” link party. So cute! Thanks for sharing a tutorial on how to make it! Taryn. this turned out precious!! I have to get to the hardware store!! Thanks for the great tutorial..this is just perfect for Valentine’s Day!! Thanks for sharing!! What a beautiful piece of art! I love the ombre colors you used. This is so pretty! I found you on Sugar Bee Crafts :) Have a great day! Wow, that turned out great! So cute and festive! Wow- I actually have a stack of shims left from when we built a door from the garage to the “laundry room”. I love this! Thanks for the idea- it looks great! 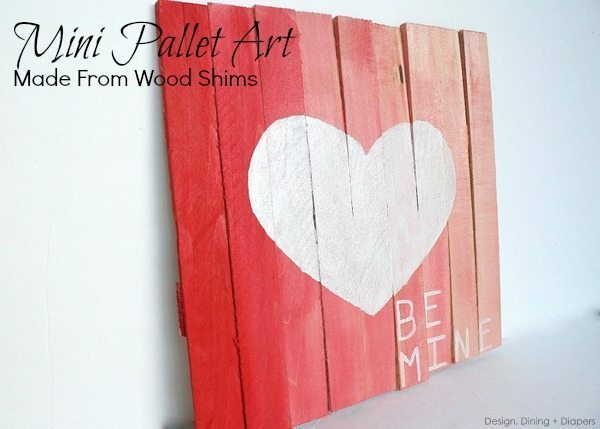 Taryn–I love how clever you were to do this faux pallet art for Valentine’s day! it really is adorable! Too cute Taryn! Very creative and I love the paint job. Have a great weekend. This is really cute – great idea! Nice artwork! Simple but cute!